Assembly operations have begun. | LIXIL VINA Co., Ltd. Assembly operations have begun. 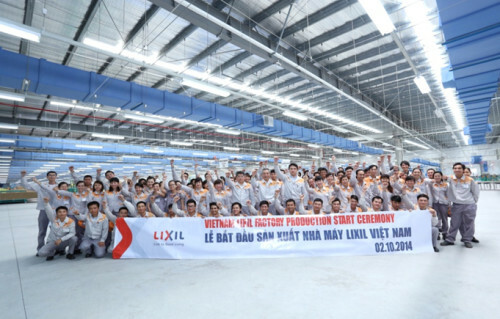 - A general housing equipment company in Vietnam LIXIL VINA Co., Ltd.
LIXIL VINA held a kickoff ceremony for assembly on February 10, 2014. Through the efforts and cooperation of our employees, the Processing Department was established and production was up and running in a short period. Our company is capable of producing 2,300 t/month. We are working so that we can manufacture aluminum and plastic sashes, doors, exteriors, and other products not only for our company in Japan, but other Asian markets as well in the future.